You’ve undoubtedly heard of ‘applied behavioral analysis’ (ABA) and that ABA is ‘best-practices’ when it comes to the treatment of autism. However, it’s important to note that ABA is a systematic approach to developing and implementing treatment methods, not a specific strategy per se. In any case, I’ve written about ABA in prior posts (to read one, click here) and how it is used as a foundation for the two specific strategies described below. A specific approach I highly recommend, based in ABA, is something called discrete trial teaching. In my opinion, there is nothing better to teach specific skills including mimicking, labeling, requesting, categorizing, and the beginning of conversational skills among other things. I’ve presented and created videos about this approach on my Youtube channel and on another of our sites, appletreeinstitute.com. This approach is structured, systematic, regimented and predominately done at a table (sometimes referred to as ‘table-time’). There are countless other videos on YouTube describing this approach; check them out!! You won’t find a better method to teach specific skills to your child. As much as Discrete Trial Teaching is formal, systematic, and regimented, the Early Start Denver Model (ESDM) is free-flowing, in-the-moment, fun, and relationship-building, with strategies that are designed to do just that, build your relationship with your child!! This is especially important in that a primary sign of autism is an aloof quality and a general lack of social engagement. 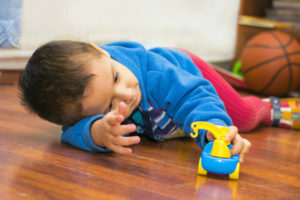 This approach takes everyday events and routines such as getting dressed, eating a meal, changing a diaper, clean-up, reading a story, playing with a toy, and leverages them to become dynamic relationship-building activities that make the parent “center-stage” in the endeavor and in the child’s life. Given that, quite often, a parent’s number-one concern is that they can’t get their child with autism to properly engage with them, this approach is vital. There too are excellent videos describing this approach on YouTube, as well as the excellent resource, The Early Start for Your Child with Autism, by Rogers, Dawson, & Vismara. So, we talked about DTT and the ESDM as two very different but complementary approaches to build and develop both specific skills and, more generally, your relationship with your child. It’s well worth your time to learn about both approaches. If you wish to learn more about these approaches and have questions about the specific elements, don’t hesitate to reach-out and email me at jcarosso@cpcwecare.com. God bless.